From Frank Loesser, the composer of Guys And Dolls and How to Succeed in Business Without Really Trying, comes this touching, dramatic, music-filled love story. 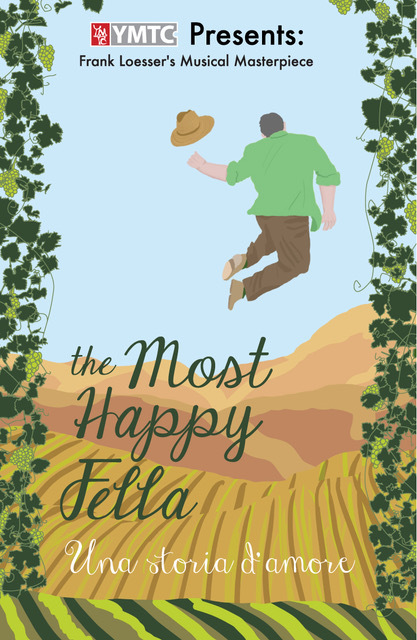 Your heart will be warmed by this May-December romance when a city bride from San Francisco is wooed by an aging Napa Valley Italian grape farmer who nearly botches everything until his true goodness shines through. With a gorgeous score including such songs as “Standing on the Corner” and “Warm All Over” and spirited dancing, it’s a simple and touching love story that makes for extraordinary theater. Group Discount: 15% off of ticket purchases of 10 or more seats for a single performance. Please note: Online ticketing closes 3 hours prior to curtain time for each performance. However, tickets will still be available at the theater box office, which opens 1 hour before curtain time. COME TO THE CAFÉ! Tony’s Napa Caffé Amore will offer sweet and savory treats at every performance, and will open 1 hour before each show.